BEIJING - The Energy Saving and New Energy Vehicle Development Plan (2011-2020), which aims to reduce environmental pollution from the booming auto production, will be formally released in January 2011, after being postponed in November, said a senior expert. It will prioritize the industrialization of plug-in hybrids and pure electrical vehicles, Chen Quanshi, director of the Automotive Research Institute at Tsinghua University, was quoted by Shanghai Securities News as saying. China is speeding up the industrialization of new-energy vehicles and energy-efficient automobiles to offset rising environmental pollution from automobiles. China has 199 million motor vehicles. The nation sold 13.6 million cars last year, overtaking the United States as the world's biggest auto market. About one-fifth of the country's cities are suffering from serious air pollution from car emissions, said Liu Zhiquan, an official with the Ministry of Environmental Protection. Analysts said that developing new-energy automobiles is the best way for China to save energy, reduce its oil imports, and tackle environmental problems. Chen said China has an advantage in developing electrical cars. "First, China has abundant renewable energy, including wind power, since the country lacks oil resources," he said. "China also has ample lithium and rare earth metals, two ingredients essential to the development of electric vehicles." Developing new-energy cars will become a foremost priority in the 12th Five-Year Plan (2011-2015) for the auto industry, with the country's target to have 1 million new-energy vehicles by 2015, said the China Association for Automobile Manufacturers in October. Wang Fuchang, deputy director-general of the equipment industry with the Ministry of Industry and Information Technology (MIIT) said China should attach great importance to the research and development of core technologies in green vehicles, aiming for global leadership in this field in the next 10 years. China will invest more than 100 billion yuan over the next 10 years to support new-energy vehicle production to make it the world's largest new-energy automobile country, according to a statement in November from the MIIT. China's investment in new-energy cars has reached 8.5 billion yuan ($1.3 billion), said Zhang Zhihong, vice-director of the high-technology department under the Ministry of Science and Technology (MST). 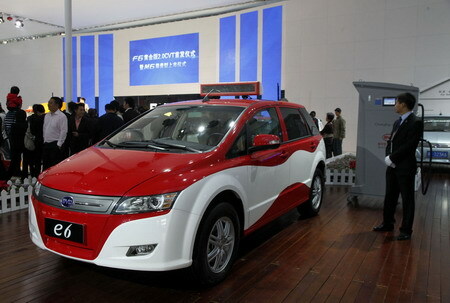 Zhang also said the MST has invested two billion yuan in new-energy cars during the 11th Five-Year Plan (2006-2010). Wan Gang, minister of science and technology, earlier said China has a head start in transitioning from research and development to industrialization in the electric vehicle sector. The MST is cooperating with the MIIT to map out industry standards and regulations for new-energy cars.